Every once in a while we stumble upon something that we can safely say is pretty flipping awesome. Whether it be durable hard shell wallets or a pen made to feel and look like it's a piece of a high-powered rifle, we'll do our best to feature it. If there's anything more exciting to a geek than a mechanical Giant Flip Clock, it would undoubtedly be the White & White clock by Kibardin Design. 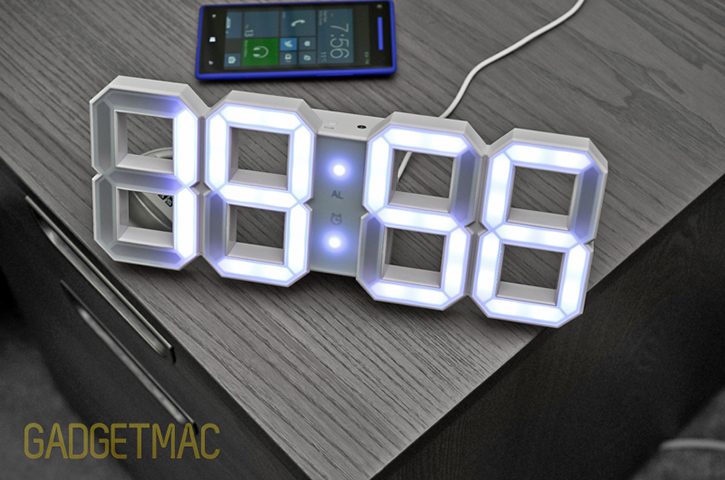 This is an all-digital LED hybrid of a clock you can mount proudly on your wall, or set standing on your desk for visitors or co-workers instant geek respect. The design is a unique concept that's beyond cool in that it brings traditional digital digits to life using a modern interpretation of a floating 3D digit type design connected to a frame made out of 1.3"-thick ABS plastic measuring 11.2" in width, and 4.3" in height. While Kibradin's White & White clock is entirely white, a Black Edition was recently made that features a black frame with white LED digits. What good is a wall clock you can't read in the dark? Fortunately, the White & White clock takes care of that with its white LED backlit digit display which glows brightly during the day, and dims automatically when it senses the indoor lightning has dimmed thanks to a built-in ambient light sensor. We found the sensor to be very sensitive to light, and it would flicker from bright to dim in the evening as well as in poorly lit indoor environments where the clock is placed away from the light source. Unfortunately, you cannot manually adjust the brightness nor turn off the auto-dimming feature. We must say, this is the most attention-grabbing clock we've used. Having one mounted on your wall is almost like a neon "we're open" sign. Glaring at the clock from afar makes the glowing digits pop out no matter the color of your wall. It also serves its clock purpose very well in that the glowing digits are extremely easy to read in the dark or in a brightly lit environment. And as for the rest of the White & White's white frame, it will obviously blend nicely against a white painted wall whilst the bright glowing digits stand out enough to be legible. But if you don't have a typical white colored wall, this will stand out as a whole unit whether it's lit or not. There's also a new black edition of the White & White LED clock which features a black outlined frame and a black power cord. Other features include an alarm function complete with a little snooze button at the top of the White & White clock. The same button also dictates the clock's date feature which cycles thru the current day of the month followed by the actual month. Besides these basic functions, there are no in-depth options to set an alternating cycle of time and date. And if you haven't already noticed, the White & White's LEDs have a blueish tint to their glow instead of emit a clean white light like a properly calibrated LED. The blueish tint isn't as apparent to the naked eye as it is captured thru a camera's highly sensitive sensor, but compared to the white plastic frame the blueish tint is definitely a noticeable blemish to the name. Around the back of the device is a flip-out kickstand for displaying on a desk, an annoying little speaker from which loud beeping sounds come from when you set an alarm or press any of the buttons that adjust the clock's time, date and alarm features. There's also a place where you can put a button sized battery to help conserve the on-board memory of your time settings in case of a power outage. But the clock cannot be powered by a battery alone. Because the White & White clock is powered by your wall outlet using an A/C power adapter, the power cord ends up running down the middle, and will of course be a nuisance against a darker colored wall. You could get creative and drill a hole to cleanly route the power cable thru like you would with a wall-mounted flat screen TV. 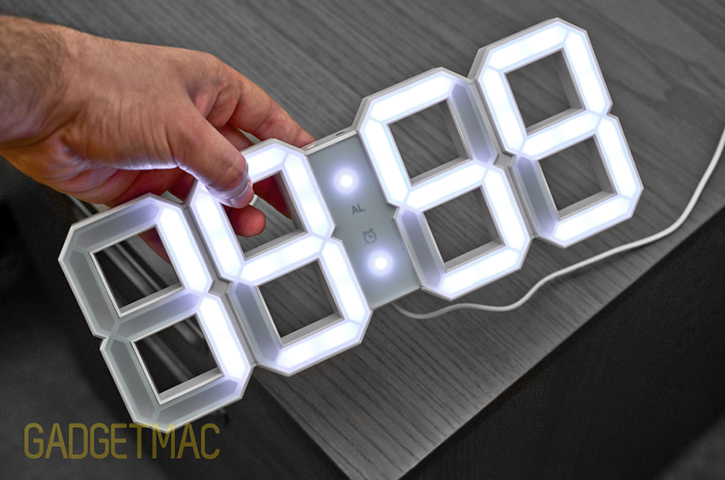 Kibradin's White & White LED clock is a unique, super cool accessory that's also versatile in its positioning and highly modern whilst being retro too. But sadly it's way overpriced for what you end up getting at $222. The quality just doesn't merit the costly price tag nor does the auto-dimming reliability, uneven backlit LED performance and very basic setting options. With that being said, there's nothing like it available elsewhere, not even on eBay. So you'll have to make due with the full retail price or hunt a cheaper alternative down.